Guns are something not all of us own. That is pretty much true. But it is never unnecessary to learn about this lethal weapon, just in case. So what is it about guns that we need to explore? The answer is many things. But if you want a good head start, we recommend you look at the two most common types of guns: auto and semi-auto. Auto guns are an integral part of the military or law enforcement forces. On the other hand, semi-auto firearms are something that a commoner can purchase if he or she wishes to. While both of them are popular in modern society, not everyone can tell them apart. The myth surrounding auto and semi-auto guns has been confusing for people. So what is the difference between auto and semi-auto guns? 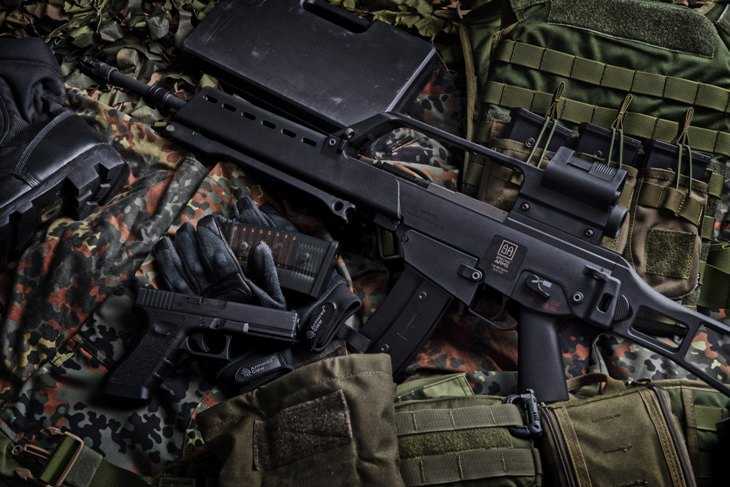 In this article, we attempt to offer a detailed explanation of these two kinds of weapon. We believe having an understanding of firearms is essential in our lives, and we hope to deliver you the knowledge you deserve. If you are curious about them, don’t hesitate to scroll down and find out more! We promise you nothing but the best insights into the difference between auto and semi-auto guns. If you pay enough attention, you will notice that these two types of weapon have one thing in common: the “auto” label. So before diving deeper into this, we will first examine why they both share this auto feature. The word “auto” refers to the fact that auto and semi-auto guns can reload automatically. In other words, you don’t have to put in new bullets every time you finish your shot. Okay, now we have got quite an understanding of their similarity. But what about the difference? 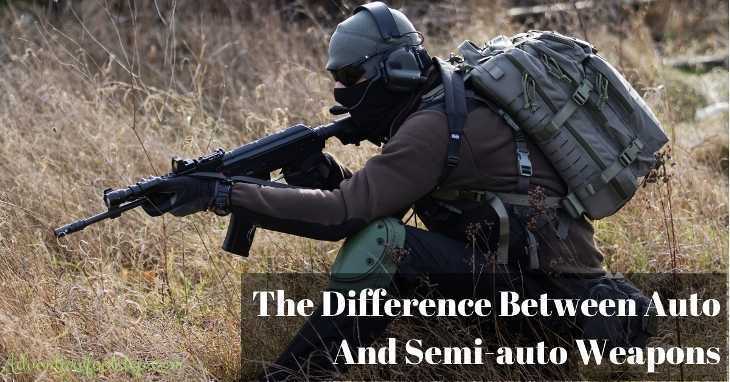 What differentiates a semi-auto gun from an auto gun? Like we said before, a semi-auto gun can reload automatically. However, when you want to fire, you will have to pull the trigger on your own. As long as you still want to shoot, you will need to repeat this act. It is due to the design of a semi-auto gun. Once you make a shot, the cartridge will start working. It will expel an amount of gas powerful enough to cast a bullet out. After your first bullet is fired, the next one will be loaded automatically into the firing chamber. This time, you will have to pull the trigger once again. Repeat the cycle and your bullets will be out until the cartridge is empty. While a semi-auto gun requires you to pull the trigger every shot manually, an auto gun will do the trick for you. You only need to fire it by hand one time only, and the cartridge will automatically cast the bullets out. So why is the difference? The design of an auto gun allows you to fire the first bullet, and then let the firing chamber do the rest. All you have to do is to hold the trigger in its place. Therefore, the firing speed of an auto gun is much faster than a semi-auto one. An auto gun is more destructive. Also, it can cause greater harm if used in the wrong way. Therefore, this weapon is limited only to professional use. The police and law enforcement are the main organizations allowed to own these auto guns. A semi-auto gun, on the other hand, can be used for casual purposes such as hunting. Commoners who pass the background check and other necessary tests can obtain a semi-auto gun. Of course, the authority will keep track of those in possession of semi-auto firearms to regulate their use. Spotting an auto gun is easy. But it can be a challenge to understand which kind of weapons known as semi-auto. Below, we will break down the difference between auto and semi-auto guns by pointing out the category of semi-auto. Usually, there are three main types of semi-auto guns. They are pistols, rifles, and shotguns. These three types fall into the semi-auto section because of their designs. They can reload themselves automatically, meaning you do not have to put in a new bullet every time you decide to fire. Also, all of these guns come with adjustable triggers that are conducive to quick pull and fire. But remember to be careful! Some of the semi-auto weapons can recoil violently, and it can harm your body if you fail to grip the gun tightly. People also classify guns with recoil as semi-auto because of their reloading mechanism. The force from recoil will clear the firing chamber and, at the same time, push new bullets into the cartridge. Tada, now your guns are ready for another shot. But some other semi-auto guns do not make use of recoil. Instead, it relies on gas to do the trick. The gas will pressurize the piston, pushing it into the firing barrel. The cylinder will then clear up the used bullet shells and give room for another load. In short, semi-auto guns are more diverse in mechanism than their full-auto counterparts. But in the end, it all boils down to their automatic loading ability and the requirement to pull the trigger. Now that you have reached this point of the article, we hope you have had a decent amount of knowledge about guns. Like it or not, guns will stay with our society for a long time. Instead of having endless debates on guns and their uses, we propose another radical approaching. We should educate ourselves as much as we can about firearms, so we understand what to do and what not to do in different situations. The first step in understanding about guns is to know the difference between auto and semi-auto weapons. In our piece, we have tried to cover the most fundamental aspects for you. If you find this information helpful, please do not hesitate to share it around. It is 2019, and we believe sharing is loving! And if you are planning buy a scope for your Ar rifle, read my article here. You will find the good one!